Three years before the Financial Panic of 1873 and with the Civil War over, building was booming on the Upper East Side. 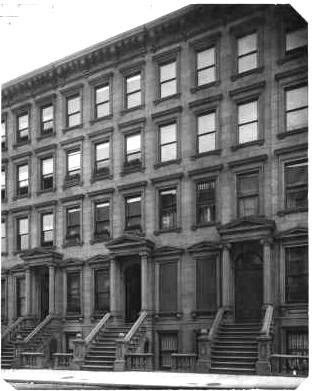 Developers Winters & Hunt were part of it, that year beginning construction of a long row of eleven brownstone homes stretching from No. 30 to 50 East 74th Street. Designed by brothers David and John Jardine (who would become developers themselves before long), the uniform Italianate rowhouses were rather stoic, offering as their most eyecatching feature their handsome columned entrances and hefty stone stoop railings. No. 40, in the center of the row, was purchased by lawyer L. B. Clark. In October of 1879 he leased the house to William H. Knapp for four years at an annual rent of $1,100. Knapp’s rent translates to an enviably-reasonable $2000 a month today. The 56-year old Knapp was married with two sons and two daughters. He was “in the steamboat and transportation business,” according to The New York Times; and was the supervising engineer for the Department of Charities and Correction. By the time that Charles H. MacVeagh purchased the house at the turn of the century, the neighborhood was undergoing drastic change. One-by-one the outdated Victorian brownstones were being razed or remodeled and MacVeagh would be quick to join the trend. He commissioned architect Augustus N. Allen to rip off the old façade and produce a modern residence. The result was an imposing neo-Georgian mansion of brick and limestone. The style had only recently made its appearance, presenting a stark and dignified contrast to the overblown ornamentation of the Beaux Arts mansions rising nearby. A stone entrance portico supported an attractive balustrade balcony at the second floor where French doors were framed in carved limestone. The configuration was repeated at the third story, where the balcony railing changed to cast iron. The bowed façade stopped at this level, creating a spacious terrace at the fourth floor. Above it all a copper-clad mansard with two dormers saw behind a stone balustrade. The wealthy MacVeagh was a banker and First Vice-President and director of the Federal Steel Company. 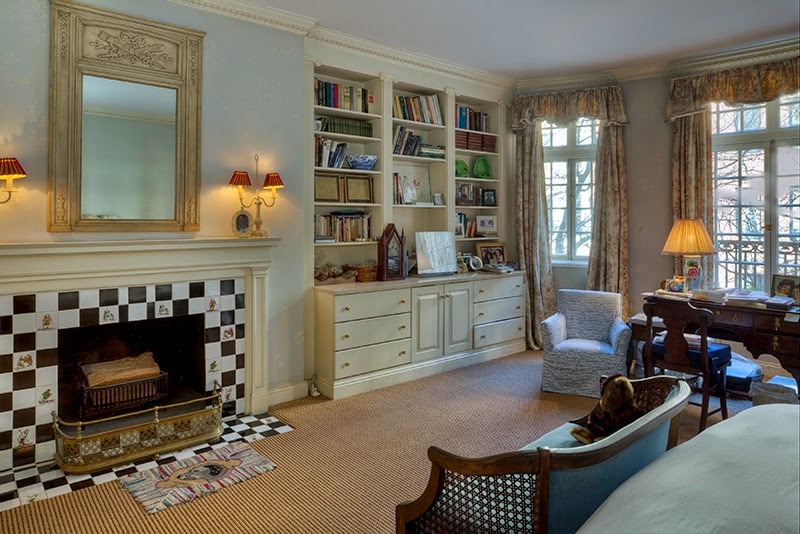 The similarity of his name with that of Charles S. MacVeigh, who lived, coincidentally, at 40 East 71st street, has caused confusion for some architectural historians. Both MacVeagh and his wife, the former Fanny Davenport Rogers, were active in charitable causes; and Charles was a trustee of the Institution for the Improved Instruction of Deaf-Mutes. 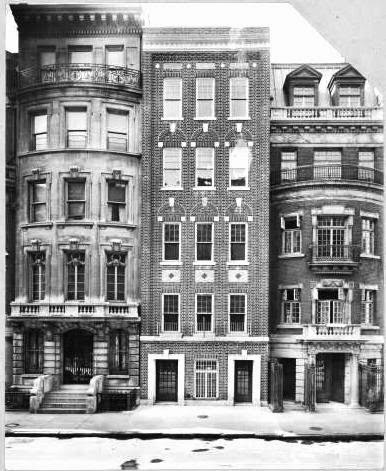 A year after renovating the 74th Street house, he became general solicitor and assistant general counsel of the United States Steel Corporation. Blacked bricks add a sense of antiquity. Exquisitely-carved cornacopiae decorate the second floor doors. The MacVeaghs had six children—all boys. The absence of daughters in the household would not stop Fanny from hosting at least one debutante affair. On April 16, 1915 she gave a brilliant dinner dance at the Colony Club for Margaret La Farge, the debutante daughter of V. Grant La Farge. Soon, however, the World War would put a damper on social entertainments in general. As Europeans suffered the devastation of war, Charles accepted the posts of vice-president, secretary, counsel and member of the executive committee of the Fatherless Children of France, Inc.; as well as President of the Immediate Relief to Italy Fund, Inc. Son Charles Jr. went off to Company H of the Fourth Training Regiment in Plattsburg, New York. On July 22, 1916 a case of measles was discovered in the training camp. Interestingly, serious outbreaks of measles at the time were limited almost exclusively to Army recruit depots. In 1911 a severe epidemic broke out at Columbus Barracks in Ohio, with a 5 percent mortality rate. Now in 1916, Charles MacVeagh, Jr., found himself among the recruits in Plattsburg under quarantine. The remodeling that the Ledyards commissioned was internal, leaving the façade unaffected. The family included Ledyard’s wife, the former Ruth Langdon Emery, and three children, an 8-year old boy, and two daughters, 10 and 4 years old. The renovations of No. 40 were barely done before the family moved into their summer estate at Syosset, Long Island. Tragedy would soon follow. At noon on August 10, 1917 the children’s nurse took them for a walk along the North Hempstead and Flushing Turnpike not far from the home. Mrs. Howard Barney was riding in her limousine with some friends as her chauffeur, Jesse Hayden, rounded a curve that hid the pedestrians from his sight. The nurse saw the approaching automobile and grabbed two of the children, pulling them to the side of the road. She called to 4-year old Virginia to follow them. But it was too late. Mrs. Barney “hurried with the unconscious child to her residence, a little more than a mile away from the scene of the accident.” It was of no use. Before Dr. J. S. Hall arrived, the little girl had died of a fractured skull and internal injuries. The Record and Guide got it half right. George Whitney was certainly a “well-known New Yorker;” but he had no intentions to occupy. Whitney had just completed his own 40-foot wide mansion next door at Nos. 36-38 and his purchase of No. 40 was no doubt to protect his interests. Whitney was a partner in the J. P. Morgan banking firm. Coincidentally, perhaps, J. P. Morgan was the uncle of Lewis Cass Leyard, Jr. Whitney would retain possession of the house until August 1930, when he sold it to Kenneth O’Brien. Almost simultaneously he sold his adjoining mansion to Artemas L. Gates. The original entrance doors survive within the rusticated limestone base. In 1942 the house was divided into two apartments—a duplex and a triplex above. In 1980 it received another renovation, resulting in a total of seven apartments. Unfortunately, grand turn-of-the-century interior layouts and details do not often conform to modern apartment configurations. Few of the mansion’s details survive. Nevertheless, a one-bedroom, one-bath apartment was listed in 2014 for $7,000 a month—almost four times the equivalent rent William Knapp spent for the entire house in 1879.